"The Light Shines for All." Lawrence Academy recognizes you for who you are and inspires you to take responsibility for who you want to become. Due to changes in the Athletic Schedule, Screenagers will now be shown Tuesday, April 23, at 7:00 PM in the MCC. SCHEDULE CHANGE: Don't miss our Parents’ Association program with a special screening of ScreenAgers – Growing Up In the Digital Age, Tuesday, April 23, at 7:00 p.m. in the MCC. Peruse the drop-down menus below. The Spartan Newsletter may be found here. The 2019 - 2020 Event Calendar (PDF) is live and updated (re: Winter Long Weekend 2020). Be sure to let us know if you are not receiving the weekly parent eNews. *Activities with * require an online sign-up. Required dorm meetings at 7:30 PM on Sunday. • Seniors & Juniors – order your class ring this Thursday at Lunch. See THE PAGE for the specific information. • Student Government Elections mid-May – includes Judiciary Council & Executive Board with Senior Cabinet – candidate registration opens May 3. Anyone may join a committee – students do not need to be elected to SG to be a member of a committee. Faculty are welcome to join the committees as well. Click here to join a committee. Community Life Committee – this the group works on activities, the calendar of events and plans specific weekend events together. Club leaders, proctors, and anyone else who wants to get involved with the activities we offer beyond the academic day may serve on this committee. Special Events Committee – plans homecoming, formal events, and end of year activities like a field day and the underclassman night. AAA (Academics, Arts, and Athletics) a space to discuss the intersection of these areas and how to strengthen that intersection or to discuss issues which affect these areas. The FAQ Page - has valuable information regarding the 2018 - 2019 school year. Another way to stay in the know is to follow us on social media (via Twitter, Instagram, YouTube, and Facebook). Parents’ Association program with a special screening of ScreenAgers – Growing Up In the Digital Age. After the program, stay and enjoy a PA lunch before afternoon games. Saturday, May 4, 6:30 p.m.
Tuesday May 14, 6:30 p.m. Please check out the Parent Volunteer Sheet if interested in becoming involved. If your child is a day student and you need to report their absence from class or their afternoon commitment, please call the daily attendance line (978-448-1518) or e-mail Tanya Clark (tclark@lacademy.edu). Normal WEEKEND departures are submitted by the student through the REACH system. Daily absences (you’re taking your child to the doctor’s office, etc.) and WEEKNIGHT absences (your child is spending a weeknight at home) must be communicated directly through the daily attendance line (978-448-1518) or by e-mail to Tanya Clark (tclark@lacademy.edu). After 3:30 PM, and on weekends, please contact the faculty member on duty (OD) at 978-758-7896 to update the school about your boarder’s sign-out. Parents/guardians must communicate this information directly, students cannot call in changes themselves. All weekend sign-outs are due by 1:00 PM on Thursday. REACH shuts down at this time and does not accept new sign-outs until 8:00 PM on Sunday. Students may not use Uber. Lawrence Academy has a list of approved drivers and services that have passed all of the necessary background checks. Please contact Andrew Healy, dean of students, for more information. Students may not sign-out to a hotel unless a parent or guardian is present. Both bus lines arrive on campus at approximately 7:45 AM. The academic day starts at 8:00 AM. Return departure from Lawrence Academy in the fall and spring is 6:30 PM (during the winter, the return is at 7:00 PM). The bus leaves from behind the dining hall. Students who are not able to catch the evening bus due to an away game, late practice or other school commitment must arrange for their transportation that evening; bus service is not adjusted to accommodate late practices or games. During the winter months, a one hour snow delay bumps the listed departure back by one hour, a two hour delay bumps the listed departure back by two hours, etc. When school is cancelled (weather, head's holiday or long weekend) bus service to campus is also cancelled. Visit Community Life Sign-up page for all CS options and weekend activities. Also visit the Community Life Calendar. PJ's for Cradles to Crayons - Join the Boston Bruins in helping this organization collect new pajamas, infant size through adult small or medium. View the full monthly collection list. The community service graduation requirement of 6 hours a year must be done during the academic year, early September 2018 through early June 2019 for freshman, sophomores and Juniors. Seniors (Class of 2019) must have their community service – senior year and all previous incomplete years – done by February 22, 2019, the last day of winter term classes. We always encourage students to volunteer over the summer for programs they are interested in learning more about, however summer hours may not be used towards the small requirement we have. 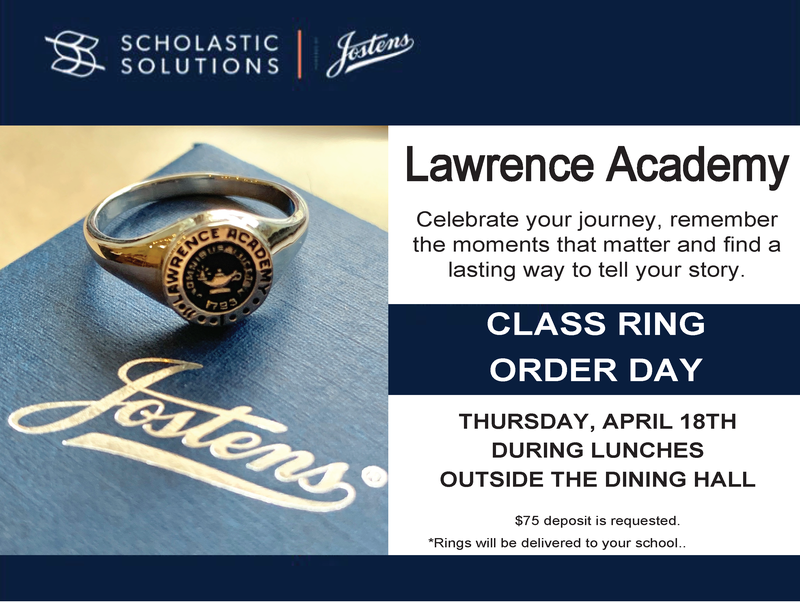 Jostens was on campus on Thursday, 4/18, during the lunch block to take orders for class rings from Juniors and Seniors. If you are still interested email our representative directly Kate Toman - Kate@scholasticsolutions.net. Click here to view an example of the ring. Click here to learn more about the rings, pricing, and process to order. the city of Florence as a classroom. and history in the world. For more information click here or email Laurie McGowan at lmcgowan@lacademy.edu. Contacts | Admissions: 978-448-1530 | Main: 978-448-6535 | GPS: 44 Main Street in Groton. LA is a private boarding and day school educating high school students in Groton, Mass., near Boston.